Rush are hoping the band’s induction into the Rock & Roll Hall Of Fame on Thursday will open the floodgates for the progressive-rockers who inspired them. "I hope this means other great bands like Yes will follow suit," bassist Geddy Lee tells USA Today. "Deep Purple was on the ballot this year, and I was hoping they'd get in with us. We wouldn't be the band we are without Deep Purple's existence." 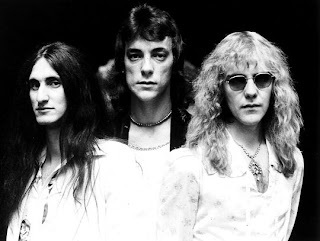 Guitarist Alex Lifeson says he hopes Rush's inclusion "opens the doors for bands like the Moody Blues and King Crimson, who had a huge influence. It's a bit ironic, really. Rock music was born in rebellion, so it's odd to have (a Hall of Fame) where there seem to be guidelines for who's acceptable and who's not." Dave Grohl and Taylor Hawkins of Foo Fighters will induct Rush at the 28th annual Hall Of Fame induction ceremony, set for Thursday at the Nokia Theater L.A. Live. The event will be filmed and broadcast on HBO on May 18.